Our boat and bike tours in Italy around Mantua and Venice feature the barge Vita Pugna. Our accommodation on the 21 passenger capacity barge is based on a standard outside-facing 2 bed cabin with private facilities. We are pleased to discuss details on request. The other vessel operating on our Italy around Mantua and Venice bike and boat holidays is 40 passenger capacity boat Ave Maria. Technical details: Length 36 m, width 5.4 m, draught 1.6 m, 21 passengers. Vita Pugna is a Dutch barge which was originally cruising the waterways around Amsterdam and has been sailing the River Po area since 2008. Under the warm Italian sun, she may be a little way from her original home, but she is definitely not a ship out of water here! Accommodation: This is in a standard, outside-facing two berth cabin. All standard cabins are situated on the lower deck. 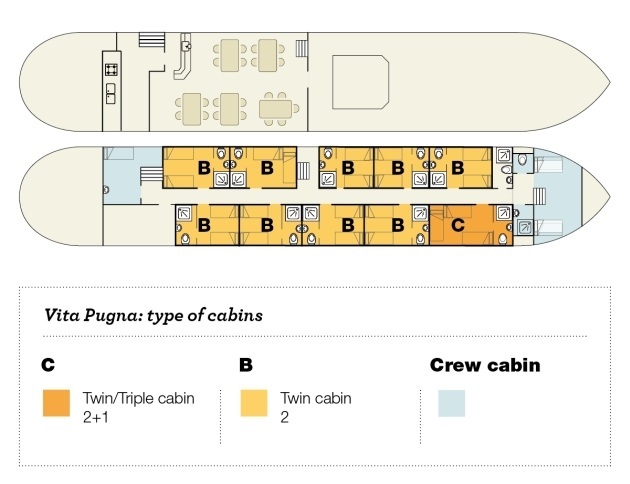 Vita Pugna has just 10 cabins. All are standard 2-bed cabins (approx. 7-8 m2) and are equipped with two single beds next to each other. An overhead drop-down bunkbed is available in one of these cabins to accommodate a third person. Cabin facilities include: shower and WC and a porthole which can be opened for ventilation. The corridor in the cabins area has air-conditioning. On board facilities: The 36 metre long barge has a sundeck with a sitting areas plus a dedicated storage area for bikes. There is a spacious, air-conditioned lounge / restaurant with a large screen TV for video / internet. Free wi-fi is available on board and there is also a hot drinks machine for free refreshments including Italian ground coffee. Currency on board: Euro. Mastercard and Visa credit cards accepted. Important remarks regarding routing/programme: The shipping company reserves the right to make changes of routing and program. In case of flood or low tide, it reserves the right to bridge parts of passages by buses and in extreme situations, reserves the right to cancel the journey on short notice. No legal right shall be constituted of both situations. (Water level is force majeure). The same applies for officially ordered – previously not announced – repair work on bridges or in case of undeserved breakdown of engine or power unit.